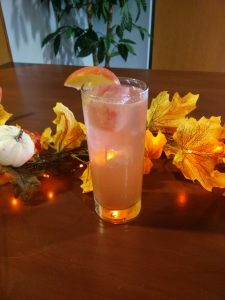 I had a great time talking about cocktail history in the United States at Freemont Public Library in Mundelein last night – I can’t imagine a better way to celebrate Repeal Day! Mix all ingredients in a punch bowl or large pitcher; garnish with orange and lemon slices. 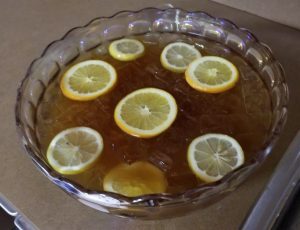 Serve over ice, and/or add an ice ball to bowl to the punch bowl if desired. Peel 4 lemons into a mason jar or other glass container with lid; add 1 cup white sugar. Stir well, then let sit for at least 8 hours in a warm place (or overnight). Then, put in a saucepan, add 1 cup water, bring to a brief simmer. Cool completely, then strain out the peels – it will be ready to use. You can store it in the fridge for up to 1 month, but the flavor intensity will decline over time. The other cocktail I shared was the Autumn Fizz – you can find the recipe for that cocktail here.